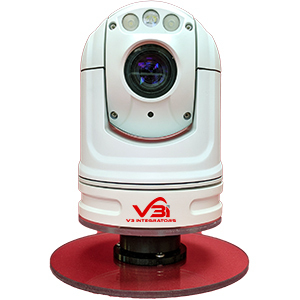 The IPTZ or Industrial Pan, Tilt, Zoom Camera from V3I is a lightweight , compact and robust Internet Protocol camera, featuring Power-Over-Ethernet. The IPTZ is designed for use in industrial or harsh environments, with an IP-66 rated housing constructed of powder coated aluminum. A height of 11.5” and diameter of 5.75” with a weight of 6.5 pounds makes the IPTZ compact, but don’t be fooled by its diminutive size. 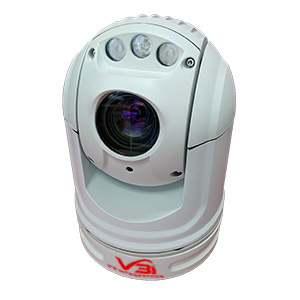 The IPTZ packs a punch with white LED lights (flood and spot), 28X optical zoom, varia-ble speed pan and tilt and of course Power-Over-Ethernet. The Modular Camera Mount (X-MCM) system allows the operator to install any of our camera mounts quickly and efficiently. Control Mode IP, ONVIF, Genetec, Milestone, etc. V3I is an ALARA solutions provider focused in the commercial nuclear industry. V3I offers its clients the benefits of more than 40 years of experience in the nuclear industry; knowledge of the facilities and their unique challenges. V3I is an aggressive, forward looking company that focuses on the client experience.